Hundreds honor and remember fallen Deputy Jacob Keltner who was killed while serving a warrant. WOODSTOCK, Ill. (WLS) -- Hundreds of law enforcement officers and community members gathered in Woodstock Wednesday to say goodbye to a husband, father, and friend taken by senseless violence. As they carried the casket to the waiting hearse, the McHenry County Sheriff's Department played a final call, as a tribute to Deputy Jacob Keltner. McHenry County Sheriff's Deputy Jacob Keltner, 35, was killed last week in Rockford while trying to arrest a fugitive. "You are brothers and sisters, it is a part of a family," said retired McHenry County Sheriff. "You are willing to, as Jake did, die for somebody. Everyday they go out and they put their uniform on they do not know if they are coming back or not." During the service, Keltner was remembered as a relentless law man with a graceful soul. "Jake, the artist, intricately drawing each of his tattoos. Jake, the Cubs fan, razzing Sox fans everywhere. And Jake the baby whisperer. Crying babies and rambunctious toddlers just magically calmed down in Jake's lap," Rev. Kendall Koenig, Light of Christ Lutheran Church said. But it was perhaps his fellow fugitive hunters who captured best Keltner's essence and legacy. "Jake was skillfully brilliant and had the most recognizable laugh I've ever known," Officer Tony Penna, U.S. Marshal's Great Lakes Regional Fugitive Task Force said. "I recently learned his brother Luke has the exact, gregarious, deep belly laugh. When I hear it, I just want to cry." "All our lives, whether we like it or not, have a ripple effect on the lives around us," Sheriff Bill Prim said. "Jake Keltner created over his too short span of life not just a ripple, but a mighty wave, of goodness and light. It is, in fact, all we can hope to achieve in this world. He just did it quicker than most." Hundreds of law enforcement officers and community members gathered in Woodstock Wednesday to say goodbye to a husband, father, and friend taken by senseless violence. Retired Sgt. Andrews worked with the McHenry County Sheriff's Department for more than a decade. She said Deputy Keltner leaves behind a strong legacy at their department. She wants his family to know they are not alone. "We all love her and love her kids and will support her and support her financially and anyway we can," she said. Thousands of miles away in Florida, a 10-year-old boy honored fallen McHenry County's Sheriff's Office Deputy Jacob Keltner with a one-mile run carrying the Blue Line Flag on Friday night. Last week, the 35-year-old deputy was shot and killed while assisting the U.S. Marshals with a warrant. That warrant was for career criminal, Floyd Brown who was hiding out at a Rockford hotel. When marshals knocked on the hotel room door, Brown fired at police, then jumped out of a third story window and shot Deputy Keltner in the head. Brown faces murder charges and a possible death penalty, but Wednesday, the focus remains on honoring Deputy Keltner. "You never get over this. You learn to manage it," said Lt Col. David Byrd of the Illinois State Police. Law enforcement officers from all over the state and the country came to support not only Keltner's family, but also the police family. Each knowing it could just as easily been them. "Protecting and helping everybody that he can and he gives his life and it is a tragic, tragic incident," said Boston Police Sergeant Patrick Elwood. "We feel it across the nation." "It hurts our heart when we lose one of our fellow brothers in law enforcement. This is extremely tight group," Lt. Col. Byrd said. The funeral got underway at 10 a.m. at Woodstock North High School, 3000 Raffel Road in Woodstock. Classes have been canceled for the day of the funeral. "It was just an amazing show of support from the whole community and from all the officers in blue," said mourner Elizabeth Ward. Many of the officers serving on the task force with him when he was shot and killed by a fugitive suspect last week were there to say goodbye. 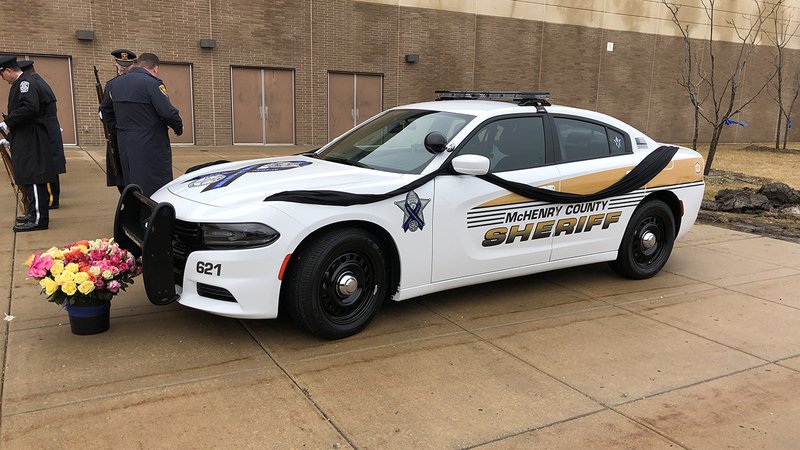 The McHenry County Sheriff's Department has been operating with a skeleton crew because everyone wanted to be at the funeral to say goodbye to Deputy Keltner. The office is accepting cards and other condolences to be delivered to his family. Deputy Keltner is survived by his wife Becki, his sons Caleb and Carson, as well as the men and women of the McHenry County Sheriff's Office, who continue his work. Donations for the Keltner Family can be dropped off at the McHenry County Sheriff's Office and the DeFiore Funeral Home (addresses below). Checks should be make out to Becki Keltner and can be mailed to, or dropped off at, either location. The McHenry County Sheriff's Office is working with the family to establish a formal way for everyone to show their support.